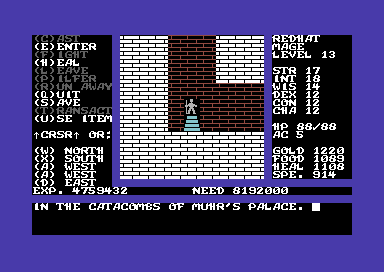 In the catacombs of Muhr’s palace, (level 10) at the entrance to Muhr’s lair. 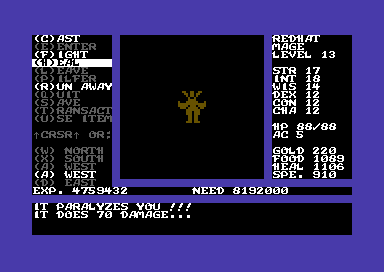 It took numerous spells and healing before Muhr finally went down. The sceptre is recovered! 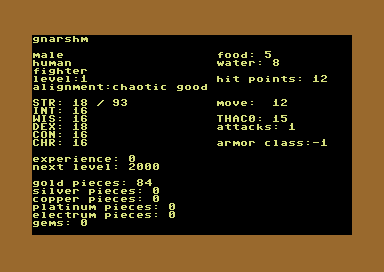 +1CHA! 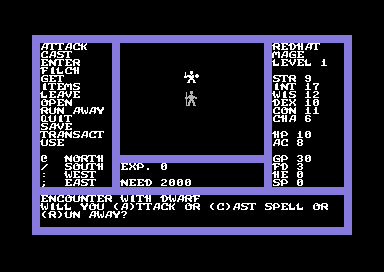 After defeating Muhr, your character is teleported back to the pillar of teleportation. 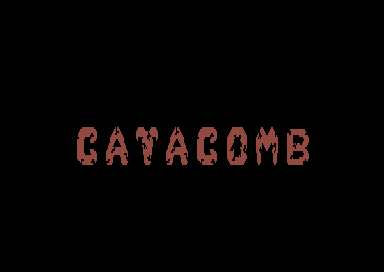 With the stolen sceptre recovered, and the demon wizard Muhr defeated, and all ten levels of the catacomb mapped, the ultimate quest is now over. 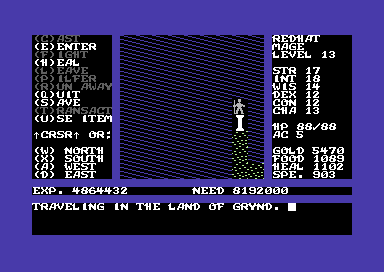 It was fairly extensive in that there is a large city with many shops and places to visit therein, plus a large wilderness area with mountains and rivers and seas, forests and deserts to wander about. 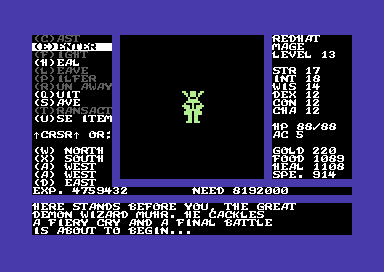 4 special items to recover throughout the wilderness to be able to use the teleportation pillar which connects you to Muhr’s island+palace whose catacombs are also vast and contain 10 levels, and finally, loads of monsters to battle, and of course the evil wizard to defeat. 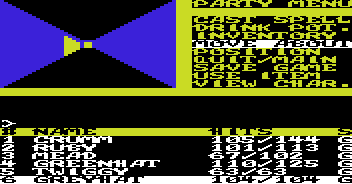 A couple of things that I found to be a bit awkward were purchasing spells/bandages. 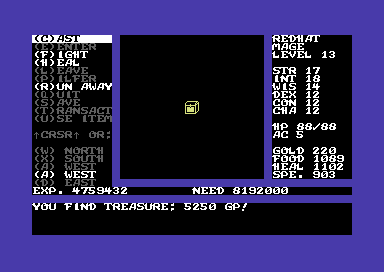 If only there were an option to give the shopkeeper 1000 gold and for him in return to give 1000gp worth of spells/bandages. That would save an incredible amount of time. 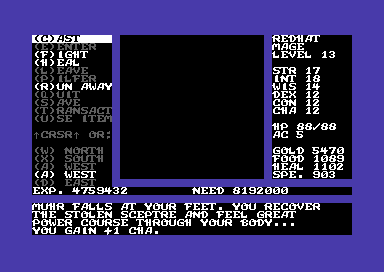 + Although I defeated Muhr and recovered the sceptre, no one at the city seems to believe me, but at least I’ve got my 13 charisma to prove it. 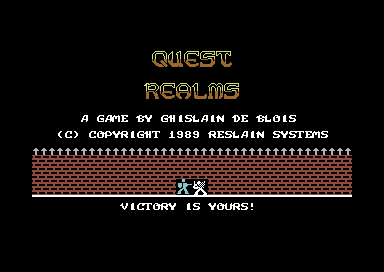 All in all, it was a blast to play through, but I prefer the party based Realms of Quest III+IV games more. 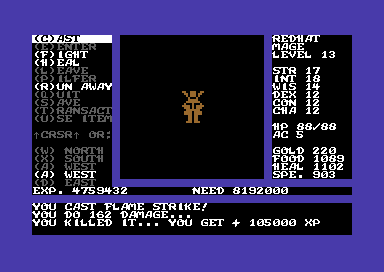 Also it seems that after you defeat Muhr and get teleported back to the pillar, the 4 items that you previously have recovered get reset from 4 to 0, so I suppose you could go back and find the 4 items again, then make your way back through the 10 levels, beat Muhr again for another +1 bonus to CHA or perhaps another stat and play on continuously? Seems likely. 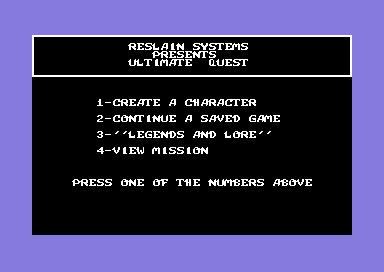 Perhaps I’ll give it another run sometime in the future. 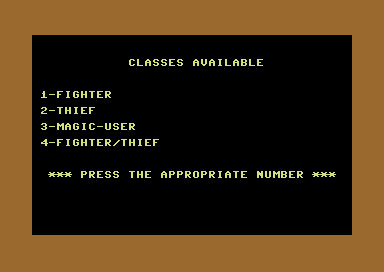 Ultimate Quest: Catacomb was the prequel of sorts to the Realms of Quest series. 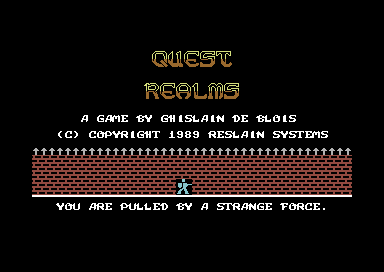 Next up……Realms of Quest I. 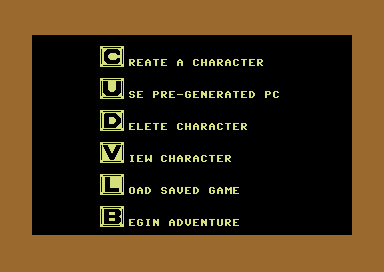 This entry was posted in Catacomb, UQ:C and tagged C64, catacomb, redhat, ultimate quest on September 10, 2014 by rubygolem. 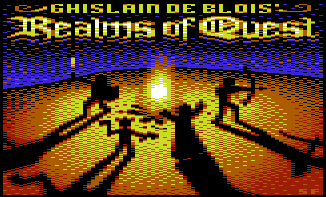 Ultimate Quest: Catacomb (2014 version), was released on side B of the 2014 release of Realms of Quest IV disk. 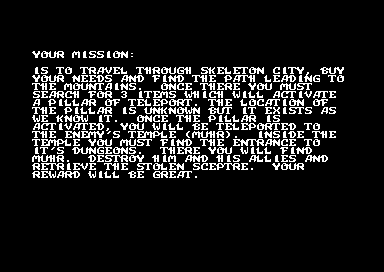 Ultimate Quest: Catacomb is the final version of what had previously comprised of the following 3 unfinished games…(Ultimate Quest 1989 version, + Catacomb, + Quest Realms). 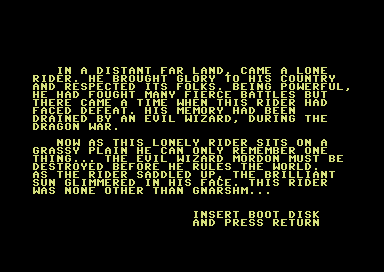 Only a small portion of Catacomb and Quest Realms were completed, and Ultimate Quest 1989 version had been previously abandoned half-way through the game. 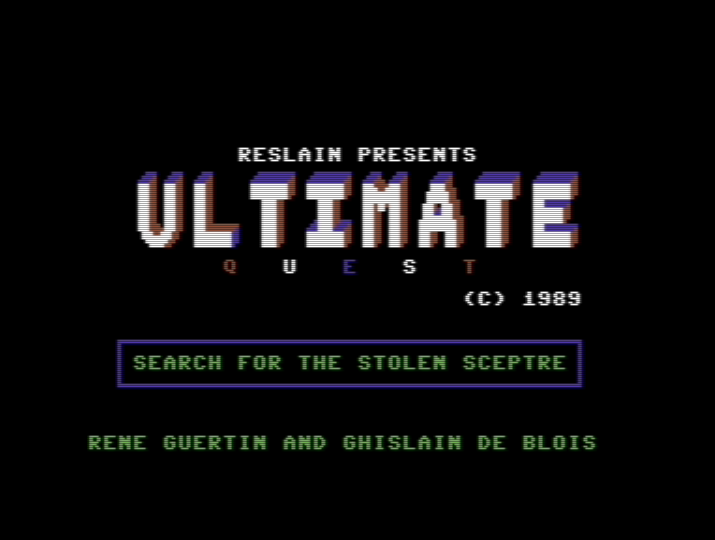 Here I post some screenshots of the unfinished games… Catacomb, Quest Realms, and Ultimate Quest (1989 version). 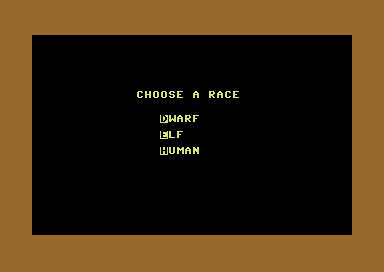 You can see where some of the graphics made their way from these 3 unfinished games to the now completed Ultimate Quest: Catacomb 2014 release. 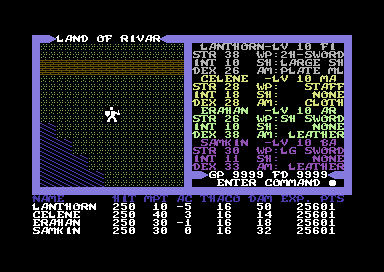 Gnarshm appears as human here as the only available races in Catacomb were human, dwarf or elf. 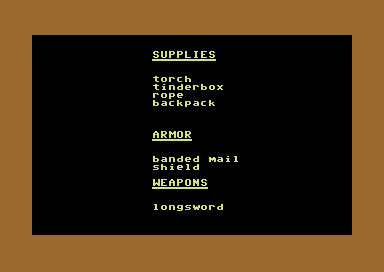 Supplies given to Gnarshm as a fighter class. 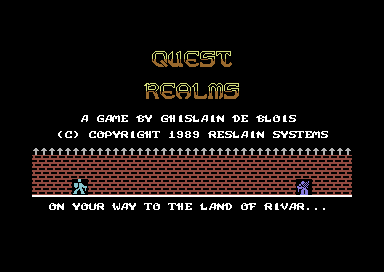 This entry was posted in Catacomb, Quest Realms, Ultimate Quest 1989, UQ:C and tagged C64, catacomb, Gnarshm, Quest Realms, ultimate quest, Ultimate Quest 1989 on July 13, 2014 by rubygolem.